In just over 13 years Antic Teatre has gone from being a self-managed space to one of the flagships of today’s contemporary performance scene, a resource centre for multidisciplinary arts and one of the focal activity points in the Casc Antic neighbourhood of Barcelona. They have been 13 years of intense artistic and cultural action, of learning and struggle to save the space from being closed down. Here is a brief history of the Antic Teatre from before 2003 up to the challenges it faces today. Antic Teatre occupies a neo-classic former residential ‘palace’ built in 1650 and listed as part of the city’s cultural heritage. 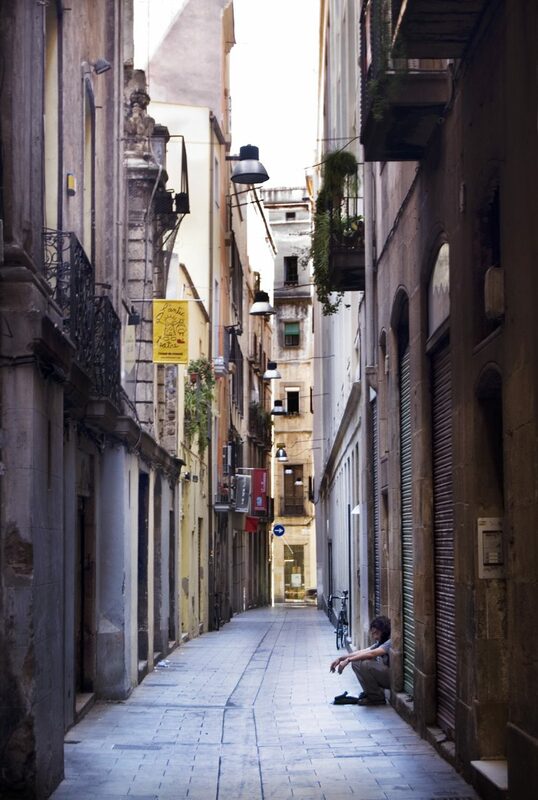 It stands in the centre of Barcelona’s Casc Antic (Old City), one of the city’s oldest neighboruhoods, historically linked to guilds of artisans and small businesses, as reflected in many of the area’s street names. The 60’s. Carnival Ball at the Círculo Obrero Barcelonés San José. At the main entrance door to the Antic Teatre there is a plaque that reads: “Círculo Barcelonés San José”. This society, active for over 100 years, began using the venue in 1951. There is also a glass panel in the bar area showing Saint Joseph, patron saint of workers. The organisation’s full name was Círculo Barcelonés de Obreros San José (Saint Joseph Working Man’s Club of Barcelona) and it was founded in 1879 by renowned architect Joan Martorell, who many consider to be the author of Barcelona Cathedral’s main facade. In the first statutes issued by the organisation, a “working man’s club” was defined as a place where all the workers of the city “can meet on workday evenings and the afternoons and evenings of holidays, to enjoy some moments of relaxation and honest leisure, and even improve their learning“. During the first few years, most activities had to do with the education of adults and children from the labouring classes, with some recreational and leisure activities. It should be noted that this institution was a response from organisations close to the Church (within the framework of social conflict and class struggle that was taking place during Catalonia’s industrial revolution period) to counter the emergence across the country of ateneos, worker’s clubs that were non-religious, libertarian and revolutionary in defiance of the established order. However, we must point out that today Antic Teatre is more akin to those revolutionary ateneos and stands for what they represented, even though it continues to manage part of the Círculo‘s archives by storing them and keeping alive the memory of the theatrical activities that took place within it. In 1951 the organisation moved from its existing location to what is now the Antic Teatre, looking for a venue with an auditorium big enough for their performances and theatrical events. From the very beginning, when men and women were not allowed to perform on the same stage together, amateur dramatics were one of the main activities of the Círculo Barcelonés de Obreros San José. This is evidenced by the large amount of surviving posters, lampoons, photographs, press articles and even awards that make up the historical-documentary files on the organisation. One of the big name artists who produced theatre in the auditorium was Pierrot, who, thanks to his cabaret and drag shows, became one of the main figures of the “Barcelona Canalla”, the sleazy underground scene of the 80s. Some years before then, around the end of the 60s and the beginning of the 70s, Pierrot, who was the nephew of one of the more active lady members of the club, showed his Impact Theatre works here. This was a theatre of horrors showing perversities, philias and phobias, always with a very resounding finale that aimed to make the aforementioned impact on the audience. All this took place during a period of strict censorship, which Pierrot knew how to circumvent with alternative texts and costumes prepared should an inspection take place. From the end of the Civil War until the late 70’s, the Círculo Barcelonés de Obreros San José was also home to theatre groups such as the Jaris Theatrical Society, as well as a number of other organisations including the Wartburg Integrated School of Art, the Jaris Cinema Club, and the members of Arte.Vi.Com.Qui. 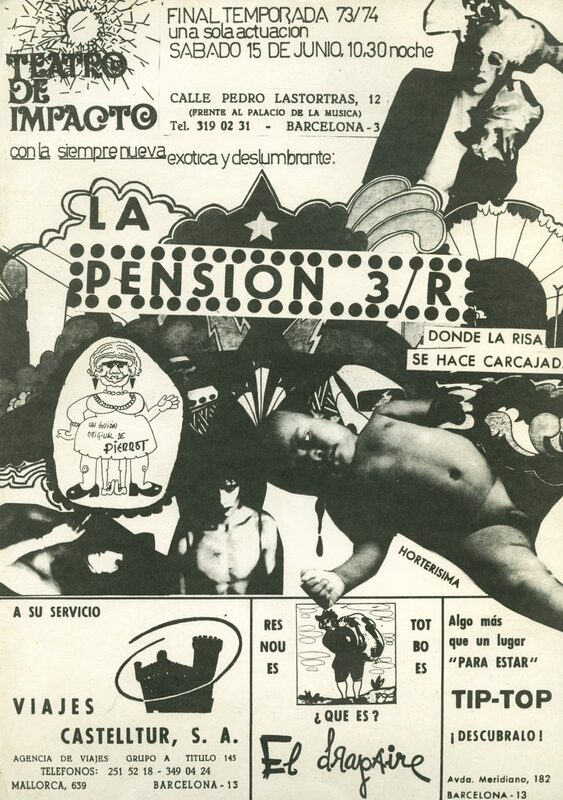 During the last days of the organisation, around 1978, the Coordinadora de Col·lectius per l’Alliberament Gai (C.C.A.G) (Co-ordinator of Gay Liberation Collectives) used the space for its meetings and also presented several shows in the auditorium in which their members took part. Another of the associations created within the heart of the Círculo Barcelonés de Obreros San José, the Agrupació Ciclista Independents (Independent Cyclists Association) still holds its board and members’ meetings in the Antic Teatre. The association was created in 1989 and remains active with more than 80 member. Issue number 6 of the magazine (July/December 2012) showing the tribute to Pierrot at Antic Teatre. In the 80s and 90s the association phenomenon reached a crisis, and social activities within the Círculo Barcelonés de Obreros San José declined markedly. The space remained open only for a few leisure activities such as subbuteo or dominoes, or as the meeting place for a few organisations. Several attempts to open bars or cafés also failed. This dismal state of affairs went on for 20 years until 2003, when the space was rediscovered and its doors opened for social and artistic activites once again. 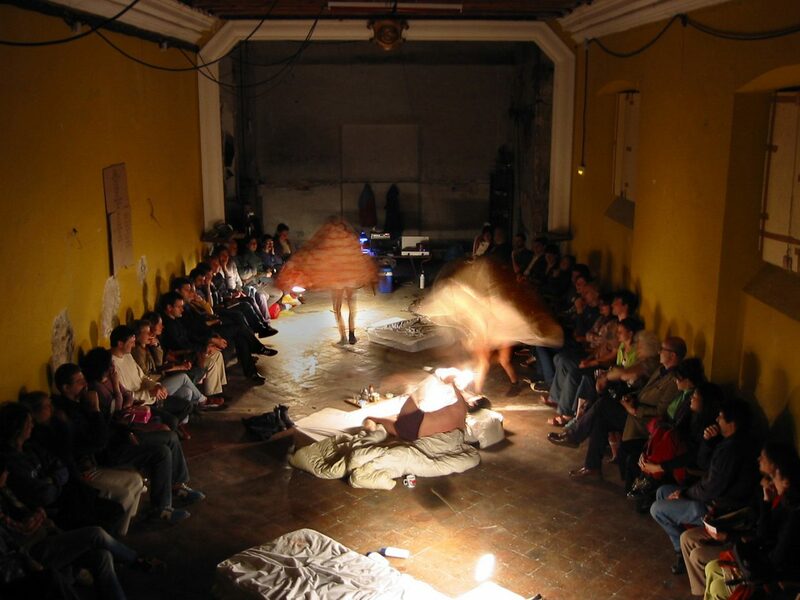 On March 27, 2003, independent artist and creator Semolinika Tomic and some other multidisciplinary artists, while searching for a place in which to rehearse their creations, discovered the Antic Teatre: an old residential palace with its own theatre hall in the very heart of Barcelona City. It was closed, abandoned and in ruins. Its location was particularly unique: on Verdaguer i Callis street, only 30m from the Palau de la Música (where, around the same time and with total impunity, Félix Millet was taking public money and using it for his own personal benefit). “On the impossibility of conjugating the verb To Love” by Roger Bernat, with Juan Navarro and Santiago Maravillas, April 23, 2003: the first performance in Antic Teatre after it reopened. They reached an agreement with the association’s president to carry out their activities in the space. Not long after, Roger Bernat, together with Juan Navarro and Santiago Maravillas, proposed staging a show in the theatre hall. It was part of the Bona Gent cycle, produced by Mercat de les Flors, a series of performances taking place in non-commercial and unconventional venues across Barcelona. Then, thanks to huge amounts of collective and voluntary effort from artists and friends, the space was cleaned out so that the first public events could take place. On April 23, 2003 the reopening was celebrated and on April 24 there was a performance of “On the impossibility of conjugating the verb To Love”. Members of the press who attended that day predicted that a new venue had appeared in the city capable of giving established culture a shake up. 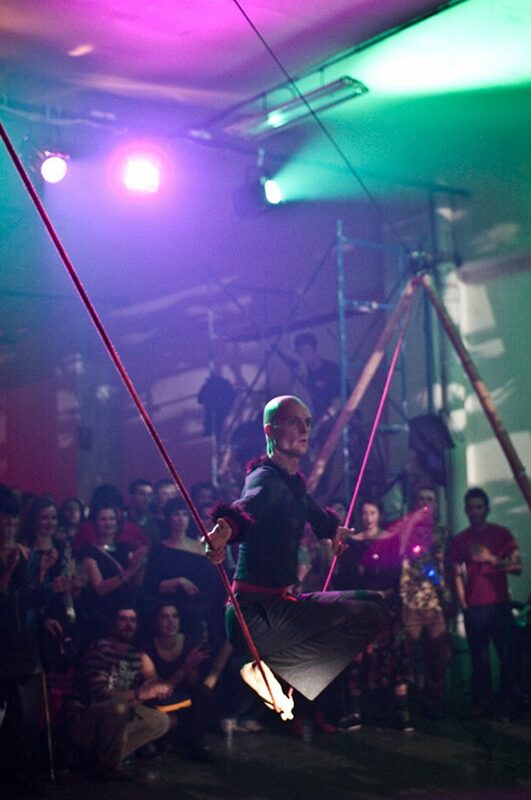 This first performance was followed by more shows by other artists, proving the need for a regular performance space in the city for work based on risk. Organisation during this period consisted of self-management. Income from the bar helped to pay the rent and the other overheads. 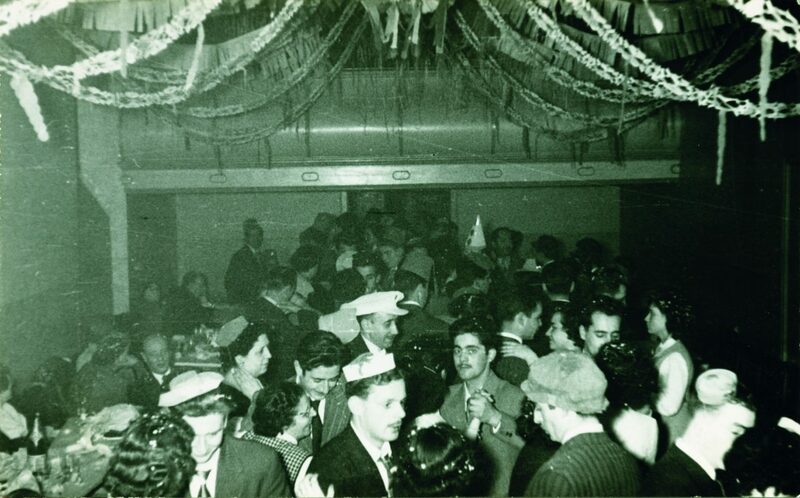 Resident artists lived from the proceeds of their own projects and shows, and at the same time volunteered their work for the various daily tasks, such as bar, box office, technical production, cleaning, programming and general management, in order to keep the Antic Teatre up and running. In the same year the theatre itself received an award: the Huesca International Theatre And Dance Fair Prize for most innovative programming in Spain. In 2005 Antic Teatre received a court order stipulating it must close within 24 hours as it did not possess a valid activities licence. At that point talks began with the relevant politicians to see what steps could be taken to prevent closure. Postponement was not enough; it was necessary to guarantee future stability and obtain an activities licence that conformed to the new safety and accessibility regulations. This meant a structural rehabilitation of the building that would cost approximately €500,000. In 2007 Semolinika gave up her personal artistic career to devote her full time energies to managing the Antic Teatre and obtaining the grant for the renovation from the Consorcio del Plan de rehabilitación y equipamientos de teatros de Barcelona, the only way to avoid closure. The daily work in Antic Teatre‘s office space went from talks with artists for the organisation of regular programming to talks with lawyers, notaries, architects, builders, politicians and bankers. Nevertheless social, cultural and artistic activity did not cease during this time. In order to be entitled to receive the public funding for the renovation, Antic Teatre had to create a business company (Antic Teatre – Espai de Creació S.L.) This company manages most of Antic Teatre‘s financial activities, although the philosophy remains that of a non-profit, non-commercial organisation where all proceeds are reinvested in its activities. 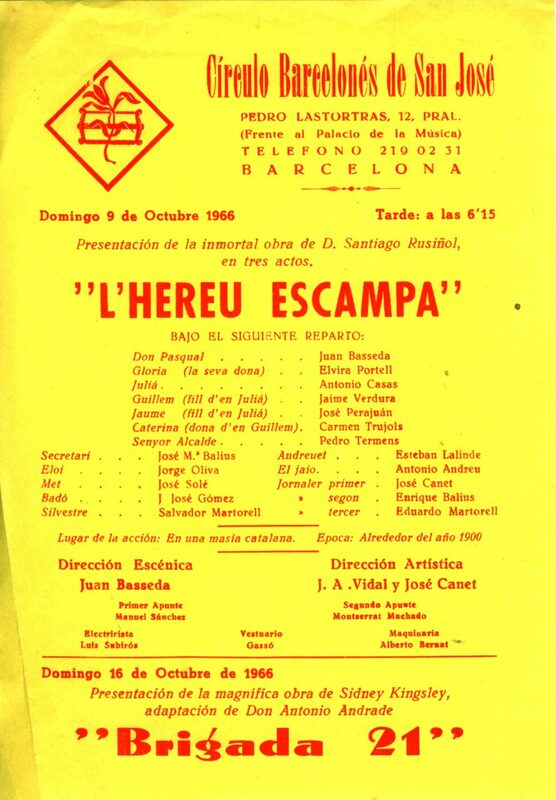 The Association (which changed its name from Círculo Barcelonés San José to Associació Antic Teatre – Espai de Creació) remained active for the development of social activities. Also in 2007 and given the fact that the auditorium was about to become unusable because of the building works, a space known as Adriantic was rented in an industrial warehouse for research and artistic residencies. This was located in Sant Adrià del Besós, 20 minutes via underground from the centre of Barcelona. This space was active until the end of 2015. In 2008, having received the subsidy from the Consorcio del Plan de rehabilitación y equipamientos de teatros de Barcelona, work began on the renovation. These were definitely the hardest years in the history of the venue. Being given the grant did not mean the end of the struggle. It was necessary to obtain credit in advance of the funding, as this would not be handed over until the actual building works were finished and paid for. Also, the grant did not cover the proposed budget in its entirety, and Antic Teatre had to find other sources for the remainder. The search for financing coincided with the economic crisis, in the autumn of 2008, when the failure of Lehman Brothers led to the recognition of a world-wide recession. This was an exhausting period, a fact recognised by the local press with headlines such as “El Antic Teatre se ahoga” (Antic Teatre is suffocating) (Setmanari El Triangle, 15/09/2008) “La crisis sí acecha a l’Antic Teatre” (Recession threatens Antic Teatre) (Público, 12/09/2008). Antic goes electric” at the Adriantic, 2009. All the money to be used on the renovation had to be found as credit. This meant the staff didn’t get paid for several months. Eventually, the loan was obtained from the Institut Català de Finances and the process got the go-ahead. The complete renovation of the building took place in several stages (click here to find out more). The bar remained open during the building works while the artistic side of things was moved to Adriantic. Once again, Antic Teatre‘s social and artistic activities kept going during this period. Finally, on January 16, 2010, the theatre was reinagurated with the new auditorium. The renovation works were not fully complete (the construction of new seating and dressing rooms was postponed until the final phase of works). Once regular programming was reinstated at Verdaguer i Callis street, Adriantic reverted to being a space for research and artistic residencies, providing these for more than 20 companies a year who developed their creative work there. During this period, once the performance space was back in use some of the projects already begun were finalised and some new ones were commenced. A strategy for projects and activities was consolidated with regard to supporting artists along the entire creation process, from the initial concept (research-based artistic residencies) going through concrete action (performances at Antic Teatre) to promotion and dissemination (by means of plans for communications, audience management and international relations) and ultimate distribution (national and international management). Particular emphasis was placed on Antic Teatre‘s internationalisation plan, which includes the projects cav_a: Catalan artists visiting ____ Artists and B2B: Barcelona <>Berlin. A major step was taken in the internationalisation process in May 2012 when Antic Teatre became a member of Trans Europe Halles, a network of independent cultural centres and one of the oldest cultural networks in Europe. In November 2013, following the final phase of renovation, the permanent activities licence was granted. In addition to the projects supporting creation, more weight was given to social and community-based actions with the creation of Antic Teatre‘s community project. Initially, workshops were held with senior residents of the neighbourhood. For a second stage, from 2015 onwards, work began with local children and teenagers. 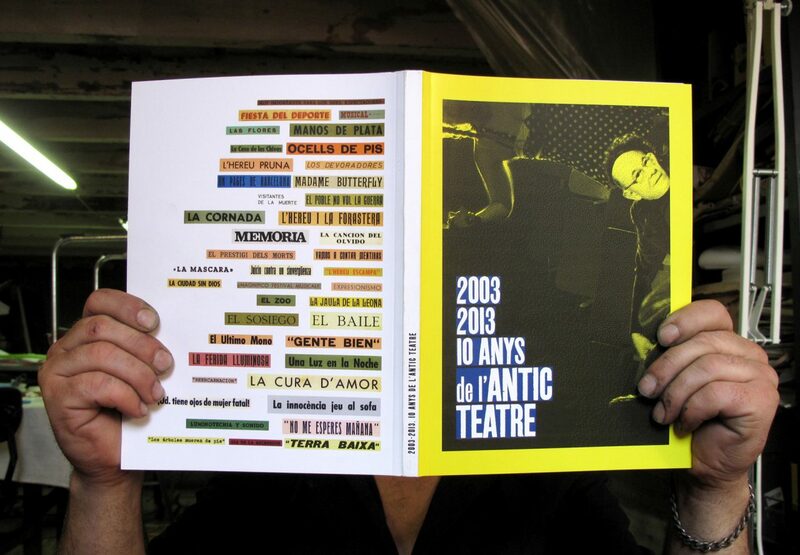 Book commemorating 10 years of Antic Teatre. Activity in Antic Teatre is very intense and dynamic. Every year, more than 200 artists perform here. This means over 60 different shows a year, and that only accounts for regular programming. On top of this, there are activities in collaboration with other organisations, and home-grown festivals such as short film festival Antic Horror Picture Show, Off Sant Jordi, or street-based action ATAC (Antic Teatre al Carrer) etc. Altogether, there are things going on more than 280 days a year in the theatre, with a total annual assistance of 11,000 people. 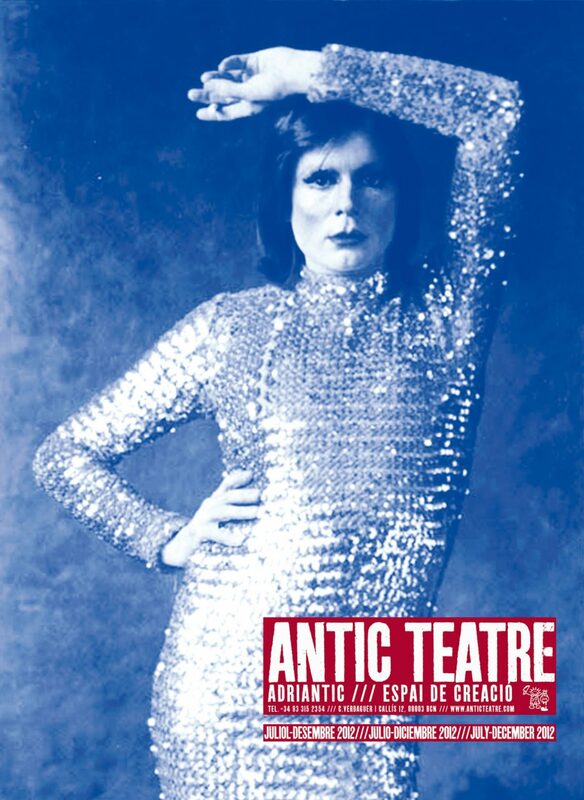 Antic Teatre survives today thanks to the efforts of a great many people who believe in it. Some of these are paid for their work; some are friends or artists who offer their help occasionally without receiving any payment. These include volunteers, student interns, etc.